This type has a flat-bottomed form with a body shaped very much like a "top". It has a high neck with a small everted rim, handles going from the top of the neck to the rounded shoulders (Panella, 1989). 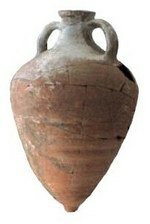 The Formlimpopoli and Empoli amphorae are comparable types. From the Tiberian-Claudian period and the end of the second century AD (Panella, 1989: Martin, 1999; Rizzo 2003). The first production centre was found at Spello, Umbria, but the wide variety of fabrics suggest other centres throughout inland central Tyrrhenian Italy, focusing on the Tiber valley (Cherubini & Del Rio, 1997; Martin, 1999; Patterson et alii, 2005). More specifically, kilns have been found in the ager pisanus and northern part of the ager Volaterranus, across Etruria and in the Sabina. Widely distributed across southern Etruria and the Tiber Valley, especially Rome and Ostia (Patterson et alii, 2005; Rizzo 2003). Wine seems to be the principal content.